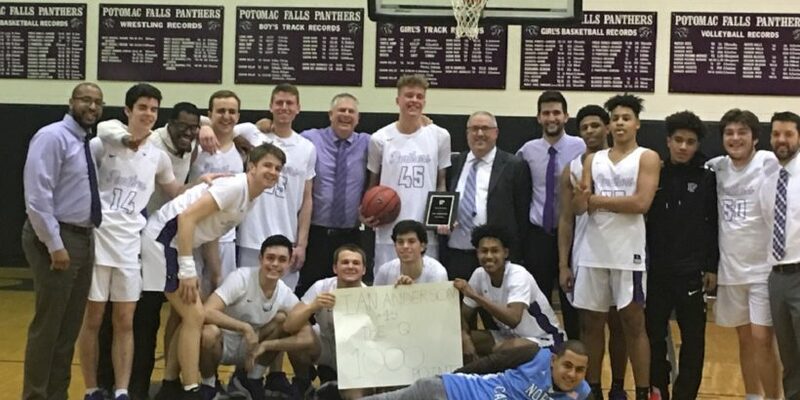 Six foot-seven-inch senior power forward Ian Anderson joined the company of Potomac Falls all-time greats Wayne Allen, Greg Graves and Lukas Mihailovich as he became the fourth player in school history to surpass 1,000 career points in the Panthers 91-68 win over Stone Bridge. The athletic big man hosted a scoring clinic as he dominated down low and led the way for Potomac Falls with 33 points and 12 rebounds while playing one of the best games of his career. Junior guard Landon Hawes also showed out with 17 points on his birthday and Junior Jalen Coker contributed 14 points for the Panthers. On the other side senior guard Evan Buckley led Stone Bridge with 18 points. Right from the tip-off it was Anderson’s game for the taking as he won the tip for the Panthers and then went on to score the first two baskets of the game. With more offensive help from Coker and Landon Hawes, the Panthers took an early 11-3 lead. Stone Bridge (5-6, 8-11) responded with an 8-0 run thanks to a pair of threes from Buckley and junior forward Isaiah Rhodes, and a lay-in from junior forward Michael Healy. After consecutive streaks from both teams and the game tied at 11, both coaches implored their teams to slow down and stay true to their game plans. A three-pointer from senior guard Hayden Hawes and four more points from Coker helped Potomac Falls take a 18-14 lead at the end of the 1st quarter. When the second quarter began, Anderson’s dominance was apparent as he scored the next nine points for the Panthers as they began to pull away from the Bulldogs. The game was briefly put on hold as the crowd erupted in cheers after Anderson scored his 13th point of the night, signifying that he had reached 1,000 career points. When the game resumed Anderson picked up right where he left off, as he drained a three-pointer for the Panthers. The momentum was completely in Potomac Falls’ favor as Hayden Hawes drained a deep three as time expired in the 2nd quarter, solidifying a 42-31 Panther lead at half. The second half turned into a showcase for Anderson as he did just about everything from closely guarding Buckley to slamming home a rim-shaking alley-oop on a pass from Landon Hawes, early on in the fourth quarter. “He had some of the best dunks in Panther basketball history tonight – and we’ve had some good ones,” Potomac Falls basketball Coach Jeff Hawes said. In their first meeting of the season, the Bulldogs were able to rally back against the Panthers late in the game, but this time around the Panthers closed the door early thanks to tough defense and Anderson’s ability to score at will. Coach Hawes credits the team’s success to a solid week of practice and a stellar offensive performance all-around. The Panthers (11-0, 17-0) remain undefeated and are also the only remaining undefeated team in the Nova Nineteen. Potomac Falls comfortably sits in first place in the Potomac district and with three games left in district play need just one more win to clinch their conference.